So far as Laurence Olivier was concerned, there were two of her. One was “my Vivien,” the most beautiful woman on earth, yet without evident vanity; an enchanted being, joyful, kind, uncomplicated, generous; moving in a cloud of perfume, exquisite in her manners, immaculate in her person, full of grace and taste and fun. This Vivien kept 75 pairs of white gloves wrapped in tissue paper and at night covered her folded underwear with a napkin of silk and lace. She was a talented actress who worked twice as hard as anyone else; she was intelligent, cultivated, at home in literature, art and music; had scores of friends to whom she was the most faithful and affectionate of correspondents, whom she showered with gifts, delighted with her wit, her stories, her games. She was a passionate and considerate lover, the perfect companion, the woman of whom no woman was jealous, who had once been the little girl everyone wanted to be like. She was too good to be true. For there was another Vivien, a hellish-shrew who shrieked obscene abuse, who knew the most wounding things to say, who in her hysterical rages broke windows, ripped off her clothes, struck and slashed at those she loved; who seduced the taxi driver or the delivery man; periodically grew fat, filthy, foul, and finally, after hours, weeks, or months of nightmare, would fall helplessly weeping, remembering nothing, begging to know whom she had offended so that the good Vivien could write humble notes of apology. This Vivien was a woman sick in body and spirit who refused to confront illness, to spare herself the calamitous interaction of alcohol with drugs she took for the tuberculosis she would scarcely acknowledge or treat. 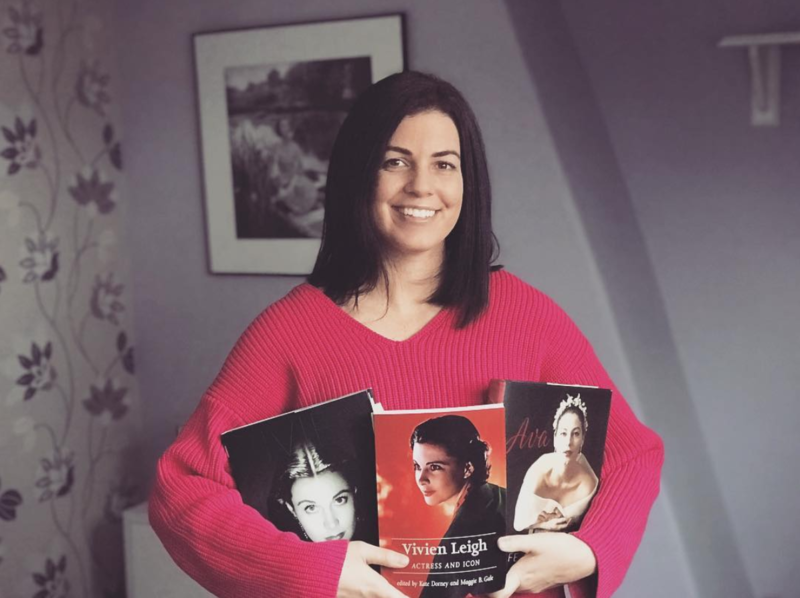 Anne Edwards (Judy Garland’s biographer, too) has done a lot of digging on both aspects of Vivien Leigh , and though she is under the subject’s spell she deals pretty plainly with the lacerating facts, if sometimes in a rainbow of fan-magazine hyperbole. 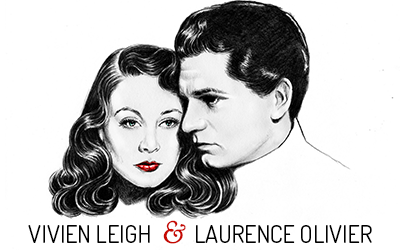 When they ran off together, leaving affectionate spouses and little children, Laurence Olivier and Vivien Leigh believed they were made for each other, for a great love, like that of Mrs. Simpson and the king who had just given up his throne. They were overwhelmed by their need for each other, by feelings they had never imagined, by a sexual greed that was plain to anyone watching them. And it was true — they were made for each other. Both had been deprived of love as children.His father was a poor vicar, aloof and alarming; his mother had died when he was a boy. Vivien ‘s case was odder. Her barely middle-class parents had lived a life of privilege in India they could not have known at home. Mr. Hartley was a broker, a womanizer, an amateur actor, his wife an Irish-Catholic beauty, manipulative and cool. Their only child loved her father, play-acting, books, her pretty clothes, her affectionate amah , but the mother put an end to it all by shipping the six-year-old to a convent in England. Thereafter Vivien saw her mother once a year, her father every two. The obedient child was petted and spoiled, voted the prettiest girl in school, awarded ribbons in religion. When she was 13 the parents joined her in Europe for a four-year tour. Their marriage was an armed truce, and Vivien may have been glad to be left at convents along the way. At 18 she was taken to England where, at a country ball, she met the nice man she was to marry, a barrister named Leigh Holman; theatrical ambitions were suspended for the vaguely disappointing role of wife and mother. Holman, though he loved her faithfully as long as she lived, failed at the outset to understand her need for a special, distinguished fate. But she knew her need and the meeting with Olivier, then a matinee idol, was not accident. Their first introduction left no impression on him, though she had already made stage and film appearances, but for her it was the beginning of a destiny. She pursued it and he was trapped, by her radiance and the hunger simmering just under her lovely surface. From that time forth, nothing she could do would ever be quite enough to deserve; him, and as the years passed and her own accomplishments mounted, she felt more inadequate, more desperately unworthy of a genius who seemed to grow greater and more unapproachable. Trouble, though neither recognized it, began at once when he pressed her to aspire to great classic roles: they were “like cannibals,” he later said; the greatest thrill in life was to survive them. It was perhaps not the best advice to a beautiful, inexperienced girl with a little voice. In years to come, in her life-and-death struggle to keep up with him, she played many classic dramatic parts honorably, but against the grain; for flawed romantic beauties were her real meat, and what she amounted to as an actress is represented best by her parts in Gone With the Wind, A Streetcar Named Desire, The Skin of Our Teeth, and Duel of Angels. Scarlett O’Hara was her first bid to make herself worthy of Olivier. He had reluctantly gone to Hollywood to play Heathcliff in Wuthering Heights, and she soon followed him; but she was after more than her lover. She had read Gone With the Wind, certain that she was born to be Scarlett. The conviction had moved no one until she arranged to meet David Selznick, during the burning of the old sets that represented Atlanta. She was exalted: passion, anger, tears chased over her lovely firelit face (“Scarlett expressions,” practiced on the plane from New York). The part was hers. Discipline and denial held her life together. She learned her parts so thoroughly — each intonation, expression, and gesture — that she could have gone through them in her sleep; and she often did in a state far from normal consciousness. Yet at the worst, when offstage sobbing and hysteria pulled her apart, she could go before an audience letter perfect. She knew she was ill, of course, and eventually depended on one doctor she trusted (he diagnosed her as manic depressive, and gave her shock treatment) but apart from that the less said the better. Illness was something to be got over without fuss; and to be “mental” was indecent, unclean. Olivier was no better prepared than Vivien to face matters. He first attributed her troubles to alcohol and nervous exhaustion, and they played a part; but after years of indulging the increasingly mad Vivien for the sake of his enchanting Vivien — the real Vivien , as he thought of it, for the flawed human whole was unassimilable — he tuned out to save his own mind and career, and ended up falling in love with a very plain young woman, the actress Joan Plowright. It was more than the end of a long marriage full of strain and self-deception; it was the annulling and betrayal of a sublime love remembered by both with anguish as it deteriorated in hostility and silence. A final interview between the couple, stage-managed by Olivier, occurred in Sardi’s, just before curtain time, with Joan Plowright beside him on the banquette. It was not the end of Vivien . She had another few years with sufferings, successes in the theater, and a devoted man at her side. He was a younger actor. Jack Merivale, and while he couldn’t fill Olivier’s boots, that was all to the good. Her mother too, rather late in the day, was always at hand; when she felt herself going under, Vivien could call on this puzzled woman to see her through the crisis. (With her own daughter by Leigh Holman, Vivien was at a loss: being a mother was a part she hardly even tried to get a handle on.) And she had her friends. the best were men with no sexual attraction for her, like Noel Coward and her first husband: with them it was possible to keep up a decorous, unblemished make-believe. To Leigh Holman especially she could turn for succor: this good, dull, devoted man, whom Olivier derided for his philistinism, never failed her. In a photograph, taken when they were middle-aged, they look like the nicest, most average middle-class couple. Could they have been, had she not made Olivier fall in love with her? Her last years were happier than any since the delirium of that love affair, though there was no question of marrying Merivale: it was necessary to be Lady Olivier and to cherish the memory of a love that someone like Joan Plowright would never understand. TB killed her. She had refused to take it seriously, though she must have preferred it to the almost nameless ill with which it went hand in hand. One night, alone with her mementoes, flowers, and neatly folded underwear, she struggled out of bed as the fluid filled her lungs and drowned her.